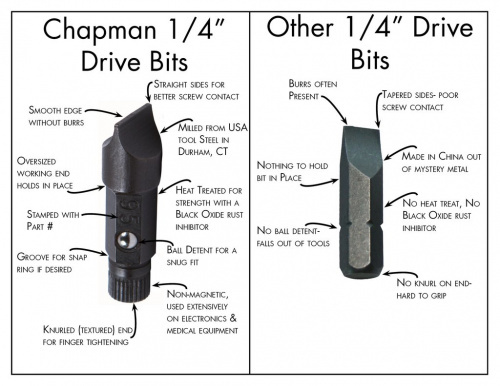 Description: The Chapman Pocket Screwdriver Set is a unique addition to the screwdriver family, as it utilizes a ¼" ratchet, similar to one found on a socket wrench, as well as four custom-built drive bits. This pocket screwdriver is aptly named for its size — not only fitting in your pocket but also fitting into tight spaces where a normal-sized screwdriver would not be able to fit. Moreover, to change the direction you need the screw to go, just flip the pocket screwdriver over! 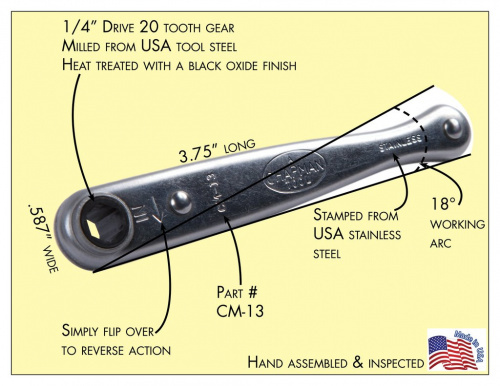 The two Phillips and two flat bits included in the set have been crafted to feature a ball detent for a snug fit inside the 20-tooth gear ratchet and knurled ends for finger tightening. Each screwdriver performs four times the torque of a normal screwdriver and has been milled in the United States from stainless steel.